The shoemaker and the Robotic Elves. Unless you have been living in a hole in the ground, you simply can’t have avoided all the hype surrounding the onward march of Robots gunning for your jobs. Just like robots are now prevalent in manufacturing, a new breed of software robot can perform thousands of front and back office administrative tasks, removing the need for humans to key data into, and between computers. I have written extensively that I don’t think for one minute that we are all about to lose our livelihoods to be replaced by intelligent software robots, but I also don’t think most people have considered the huge impact that this technology will bring. This was brought home most prominently by the recent AIIM research on enhancing your RPA implementation with Intelligent Information (source here ). Did you know that more than 80% of organisations haven’t fully automated their core back end processes? Just think how much money and effort has gone into MRP, ERP, CRM and other administrative systems and yet still less than 1 in 5 have this fully automated. Or looking at it another way, nearly 75% have less than 50% automation. I must admit to being very disappointed that we hadn’t achieved more. Perhaps the most intriguing thing for me was when asked what firms wanted their robots to focus on, the top three were improved data quality, faster service and topping the list, reducing errors. Contrast this with the top priorities for all our organisations and I was surprised that this list wasn’t topped by making the employee and customer experience better. A staggering 90% of respondents were either deploying robots or had plans to do so. Is this true for your organisation? Or are you one of the 10% of ‘laggards’ (only kidding) that haven’t got this technology planned in yet? Even more surprising was the number of live robots that the respondents claimed to have live. 47% claimed to have more than 50 robots in production. 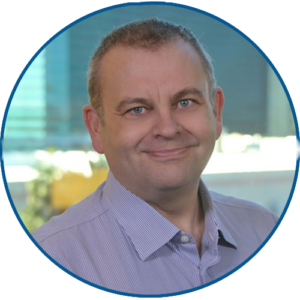 Now I have seen with users of Kofax RPA tools that some have deployed over 10,000 robots and the norm was 100+ but as an industry, the biggest challenge we keep hearing is the ability to scale out the number of robots. I have been to so many meetings recently where the customer has been totally disheartened as they had bought into the analysts leading RPA vendors, but months and years later and hundreds of thousands of their chosen currency later they only had a handful of bots in a proof of concept stage. Maybe the chosen sample of this survey was skewed towards more Kofax customers? What wasn’t surprising was the need for intelligent document processing and business process management to be critical to the success of robotic deployments. Just imagine your organisation receives an email. It might have an attachment or contain just body text but if a human needs to read this to understand what it is before extracting all the key data to hand over to a robot then the process is broken before it begins. I simply cannot imagine an RPA technology that purports to help that is ignorant of the context and content of the documents and information that it is processing. I also can’t imagine why on earth you would want to try and glue different tools together like BPM, RPA and CDA (Cognitive Document Automation) using different vendors and technology stacks. Imaging the cost, integration nightmare and massive increase in risk. You would have to be crazy or love failed IT projects to go down the route of gluing multiple systems together and try and get them to link to your own systems and with each other. Over 98% of respondents to this AIIM survey thought that the documents and data coming into their organisation was due to at least double in the next 2 years. Yet, over 70% of people thought that getting unstructured data from these inputs was the Achilles Heel for RPA. So the problem is already huge and about to at least double. In my humble opinion you cannot meet your challenge of improving staff and customer experiences without a single tool to automate process that deploys Robots, BPM and CDA. Imagine your business as the poor shoemaker trying to succeed against the odds of a savage landscape for modern retailers (OK nothing’s changed). 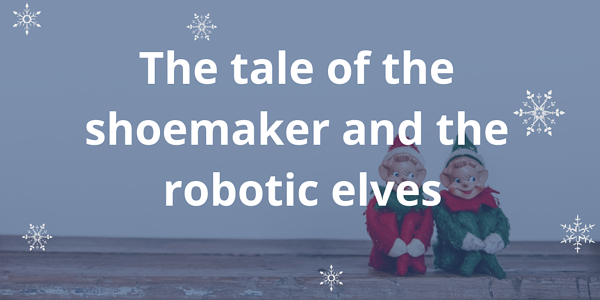 Then along comes the Robotic Elves with an BPM, RPA and CDA enabled tool that, like magic, works overnight (and day) to get all the work done so the shoemaker can stay in business. I hope this is the best analogy crowbarred into a technology context you have read today. Whilst the story is a fairy tale, the technology is very real and ready to help you. If you have any questions about how to get your own robotic elf working for you, please complete the form below.